This post can be seen on the new Frances Evesham's Blog along with new content. Around the world, we smile, hug and kiss, shake hands or bow when we meet. Our arms, bodies, voices and faces all have a role to play in meeting and greeting. How strange that we behave so differently, depending where we live. It's easy to undermine our communication messages if we don't take care. For example, Mary thinks hugs are warm and cosy. She throws her arms round someone when she's pleased to see them, because she loves them, or maybe wants to comfort them. Sadly, though, as a serial hugger she doesn't always realise when the huggee is uncomfortable. When she hugged Diane, her cousin stood still and stiff, waiting awkwardly until she finished. It wasn't because she doesn't like Mary. It's just that people don’t behave like that where she comes from. She'd have preferred a simple smile. Learn a little about the culture of the person you greet. The Chinese, says blogger Hsin-Yi, don’t hug. They prefer to nod and smile, even when greeting an old and close friend after years of absence. Even fond mothers don’t hug their daughters, but show their love in practical ways, like in the food they cook. In South America, on the other hand, hugging’s just not quite enough. Warm and friendly, Brasilians and Argentinians like to plant a couple of warm kisses on your cheek, along with a hug and a pat on the back. Men kiss men there, so northern Europeans may have to deliver something more than their usual handshake, brief eye contact or (very) restrained hug. In other parts of Europe, the French and Belgians kiss once, twice or three times on the cheek, depending on familiarity or even the part of the country. Walk into a room here and you’ll find yourself passing from one person to the next, kissing each cheek separately. Helpful hint: try putting your left cheek forward first when you kiss to avoid untidy nose-bumps. Northern Europeans may prefer the sort of hug that makes sure no body parts actually touch, or the “mwa-mwa” air kiss. Without the body contact, it’s often eye contact and a warm smile that shows you care. 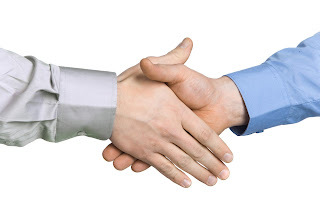 You could try the politician's favourite handshake, where you clasp the other person’s hands with both of yours, or grab their forearm at the same time, but beware of seeming controlling or condescending. Maybe the Maoris in New Zealand manage things best with their Hongi, where they touch noses and breathe together. If you go to Japan, learn to bow politely, or in India you may need to touch an older relative’s feet in order to show real respect. Your best bet is to research the country you visit carefully before you go, then spend some time people-watching when you arrive, so you can see how most people behave.